How much money owner operators make? Even some seasoned truckers would’nt be able to give you an exact answer. But let’s go over some factors that will make the difference between a big fat check and not so good payday. I will only be talking here about OTR owner operator pay since this is the area of my expertise. Basic principals will be valid regardless of the type of trucking you do, but some minor details may vary between different transportation fields. I bet that you are tired of information that does not provide any numbers and the numbers are difficult to predict since the results between two truck drivers may vary dramatically, even though they both work for the same company and the same dispatch coordinates. Trust me; this is not because someone is playing the favorites game. Hopefully, this post can spark a healthy conversation in the comment section to share the opinions and experience on this topic with our fellow truckers. Based on my observations through my professional career assuming the independent contractor runs legal hours and works at least five full days a week, the consistent take home average should be around $2200 a week or more after fuel and all the deductions. This number can be quickly pushed up to $3200 a week during higher demand seasons and if the driver is willing to sacrifice his home time in return for a better income. And of course, there are some lucky weeks where the sky is the limit. Please keep in mind the numbers above are the averages for OTR owner operators hauling dry freight and everyone’s results will vary week by week, case by case. Different equipment may produce slightly higher gross pay numbers but since this usually has more expenses associated with exploitation it will bring the take home pay to the same levels. Another very common issue I see is the fuel mileage of your truck. Unfortunately, most of “show ready” vehicles can burn a huge portion of your profits due to a poor mpg. No company or market will be able to cover for your 4.5 miles per gallon. 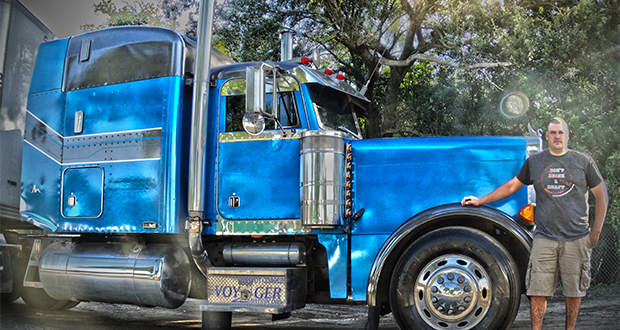 Just recently we have lost an owner operator who has ended his week with 3.8 miles per gallon and was very upset that the industry could not satisfy diesel hunger of his show-like truck (no offense, the truck was one of the nicest classics ever worked for the company). This fuel situation reminds me of my last truck as an owner operator. I had a Peterbilt powered by CAT C-15 and boy it was one powerful engine who loved diesel, lots, and lots of it. I had to do something about it. One option that I had and liked at the time was to blame the unfair world, but it didn’t help, and after six months of blaming it with no results, I had to go to my second option and look into my fuel consumption. I ended up driving no more than 63 miles per hour to get my fuel mileage to where it had to be to make money. My paychecks have improved dramatically. There are more factors to consider when looking to make the most out of trucking than just fuel economy. Good company, strategies, dispatch, consistency, work schedule and customers are just as important. The bottom line? You have to be efficient, competitive and smart to be successful in any business. And trucking is no different. We would like to hear your opinion or experience on this topic so take a second and leave your comments below. We are thinking of purchasing a T660 extended cab with a 144-inch sleeper and living/working on the road for the next 10 years. I have been out of trucking for a few years but have five years OTR running Canadian and US lanes, all lower 48 and 10 Canadian provinces. My wife will not be driving but she will be living with me on the road. Should I look into my own trailer as well? I am debating as to sign with a company that is exclusive O/O as I do not wish to compete with company units in slow periods, good/bad idea? We are secure in our marriage and close living quarters are not an issue, we live that way already. For someone who runs a lot of miles, an own trailer will increase revenues. I would suggest buying a brand new trailer, a lot of shippers won’t load anything older than ten years old. In addition to that new trailer will save you huge on tires and downtime, as long as you take care of the maintenance. The downside will be if you plan to take extensive time off the trailer will still cost you regardless you running or not. You may also want to look into carrier options before you purchase the trailer, most of them designed for owner ops with tractor only. I would start as a tractor only, and if it’s a good fit, then look into the trailer. As far as 100% owner operator company, I’ll probably have to write another article. It has its cons and pros. On the one hand, it is great when you don’t have to compete with company trucks, but in some not so fortunate cases, company truck can become angel savior. Stay tuned for a new article on this topic. I will do my best to give you inside point of view regardless of your future choice. I have a 2012 780 volvo an I just want to provide for my family.Am I facing doom and gloom having a $2000 truck note and a $600 side note and $1000 rent monthly.Voyager sounds as a possibility.